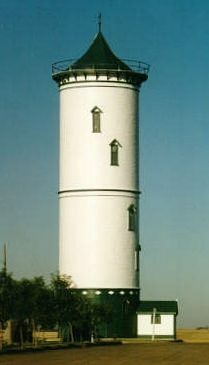 The Weyburn water tower (1909) is located in Weyburn, Saskatchewan, Canada. The water tower is constructed of an inner steel tank, 20 feet in diameter and 80 feet high, with a capacity of 150,000 imperial gallons. The unique timber housing is 25 feet in diameter and 95 feet high. The water tower was taken out of service in 1977 and was declared a Municipal Heritage Property on June 23, 1987. The entrance to the tower was demolished by a windstorm in 1976 and was reconstructed to its original design in 1982.